The Lise-Meitner-Gesellschaft aims to raise awareness of gender inequality in the natural sciences and mathematics. The Lise-Meitner-Gesellschaft was founded in 2016 by a group of early-career researchers based at universities and research institutes across Germany. Anyone worldwide can apply for membership. Most of the current members are young women working in the natural sciences and mathematics but, as Katrin Reininger, Andrea Bossmann and Mara Oßwald explain, gender is not an issue only for women. The I, Scientist 2017 core organizing team with the founders of the Lise-Meitner-Gesellschaft. From left to right, top to bottom: Leli Schiestl, Andrea Bossmann, Hanna Dierks, Daniel Kage, Mara Oßwald, Katrin Reininger, Franziska Flegel, Jenny Fabian, Maja Lenz. Photographer: Frank Burkhard. What inspired you to set up the Lise-Meitner-Gesellschaft? We all had different experiences as women in the sciences, but we all experienced a lack of female role models. We also felt that most people are not aware of the gender-related barriers and biases that still exist in our society and in the scientific culture in particular. A structure that was built by and for men with the “traditional” family roles in mind cannot work in a society that speaks of equal opportunities. We don't want to have to adapt to those structures – the structures have to be reformed to fit modern lifestyles. How are you trying to promote equal opportunities for women in science and mathematics? We believe that it is crucial to make women in the sciences more visible and to raise awareness that gender equality has still not been achieved, especially in traditionally male-dominated fields. We encourage networking as a way for people to exchange experiences and become aware that their own struggles might not be personal, but instead due to structural problems which affect everyone. 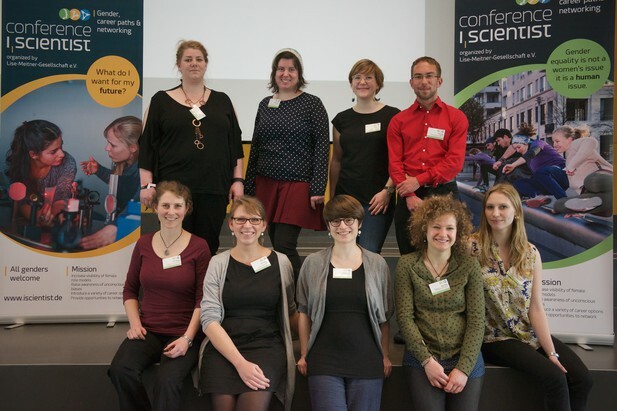 On this theme, we held the first “I, Scientist” conference on gender, career paths and networking in May 2017 (www.iscientist.de), for which all the speakers were female. “I, Scientist”. It was great to see the conference evolving into an event with an open atmosphere and full of people who want to change society. We got a lot of very enthusiastic and motivational feedback afterwards. People enjoyed talking casually to the speakers (who included professors and company managers) and hearing about their personal experiences, successes and difficulties – it’s an opportunity you don’t get very often. Overall, we think we created something that will last longer than the three days of the conference. What has been your biggest frustration? Getting men involved in the topic of gender equality. When we started advertising “I, Scientist” we thought that we could reach everyone just by writing “All genders welcome”. But that was not the case. We realized that the moment the word “gender” appears most men think that something is for women only. We ended up with around 10% men at the conference. How can organizers of gender-equality events improve the number of men involved? Don’t stop talking to people – convince them that gender equality is a topic which concerns everyone. Try to involve men in the organizational process – our male member of the “I, Scientist” team joined after we had started organizing the conference and we felt how valuable it would have been to have input from a male point of view from the beginning. It’s also helpful to have some men on posters and on stage. As a result, our new organizational team is discussing hosting a panel discussion featuring both women and men at “I, Scientist 2018”. Is there a change that early-career scientists can make in their daily activities that would improve gender equality in science? Talk, talk, talk. Let people know if you are unsatisfied with something they say or do so that they know they need to improve. But you have to be patient. Many people do not even think about the problems we still have in our society. And if talking is not enough, get engaged. Join a local working group, and organize workshops, regular meetings or a whole conference. Finally, a message to all men: You can support and promote women as well. As a group leader or as a speaker at conferences, you can suggest great female scientists as speakers and enact changes (for example, to encourage a better work-life balance) that will improve science for all genders. How can anyone reading this article get involved with the Lise-Meitner-Gesellschaft? Visit our webpage (www.lise-meitner-gesellschaft.de) and join us. We are always looking for people who have new ideas, want to promote a project and change society! And think about attending the next “I, Scientist” conference, which will take place in May or June 2018.